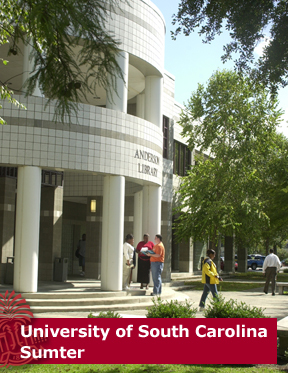 The USC Sumter Academic Bulletin is the official document of record concerning academic programs and regulations. Noncurricular information (i.e., faculty listings, contact information, college or departmental descriptive text) can be updated by contacting the Office of the University Registrar on the Columbia Campus. Any material pertaining to course descriptions or curriculum changes must have the approval of the Faculty Senate, Graduate Council, Board of Trustees, and/or S.C. Commission on Higher Education before it can be published in the bulletins. The academic bulletins are available online only. However, you may produce hard copy of any portion or all of an online bulletin using your local printer. Every bulletin page has a “Print” icon in the top right corner of each page. The University has established procedures to certify that all classroom activities are conducted by individuals with spoken and written proficiency in the English language at a suitable level. Student complaints concerning the English proficiency of an individual with classroom responsibilities should follow the grievance procedures available from the Office of the Provost on the Columbia campus.